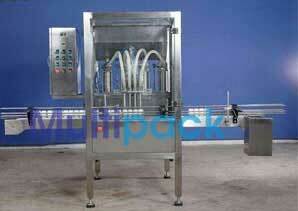 Filling machine for Batter, Honey Filling machine, Jams Filling machine, Jelly Filling machine, Ketchup Filling machine, Lotions Filling machine, Milk Filling machine, Molasses Filling machine, Nail polish Filling machine, varnish Filling machine, Palm oil Filling machine, Pastes Filling machine Tomato paste Filling machine, Tomato ketchup Filling machine, Toothpaste Filling machine, Vaseline Filling machine, Vinegar Filling machine, Paint Filling machine, Gum Filling machine, Adhesive Filling machine, Ghee Filling machine, Liquid Hand Filling machine, Hand Wash Filling machine, Petroleum Jelly Filling machine, Ink Filling machine. ElectricalSpecification: Main Machine 2.0 HP / 415 Volts / 50 Hz. ElectricalSpecification:Conveyor 1.0 HP / 415 Volts / 50 Hz. No Container No filling system. Air Pressure : Minimum: 5 Kg/cm2 Qty: 5 C.F.